With tongue in cheek, Huxley declared, "The great tragedy of [pseudo] science: the slaying of a beautiful hypothesis by an ugly fact!" I see it as the other way around - an ugly hypothesis has been slain by a beautiful fact! Recently this issue has become a very hot item! Those of you who received my NutriNotes for any time, attended my lectureships, or worked with me in any capacity over the years are aware that true nutritional scientists have steadfastly denied any scientific evidence showing a link between cardiovascular disease and dietary cholesterol and saturated fat. Many years ago when the misinformation about cholesterol was just beginning to be dispersed by the food industry, medical doctors, registered dieticians, the American Heart Association, and countless laymen, my sister, Joan, was an open-heart surgical nurse. She observed that the majority of these patients did not have elevated cholesterols. Researcher Christian B. Allan, PhD and long-time practitioner Wolfgang Lutz, MD write that "New epidemiological studies by researchers at Harvard University are showing that fat is not only benign with relation to heart disease but suggests there may be a benefit from fat in the diet... Homocysteine is now accepted worldwide as a major risk factor in heart disease. Three vitamins, B6, B12, and folic acid, all of which are in poor supply under a high carbohydrate, low-fat diet [avoiding traditional fats], are crucial for maintaining low levels of homocysteine in the blood." (Life Without Bread, How A Low-Carbohydrate Diet Can Save Your Life, Keats Pub., CA, 2000-108) Unless one is a sociopath, that last sentence should evoke intense anger if fully understood. It was reported of Nathan Pritikin, MD, who tragically gave the world the very unhealthy fat-free Pritikin Diet, that there was no fat whatever around his heart. It was also reported that he would have died of cancer had he not committed suicide. At least one study involving autopsies on suicides, showed they all had low cholesterol. Many studies associate low cholesterol with cancer. With impeccable credentials and equally as passionately, Danish Uffe Ravnskov, MD offers shocking facts via his new Web site for The International Network of Cholesterol Skeptics (THINCS). It forcefully debunks the profiteering tool of fat phobia of the brainwashed billions as created and harnessed very effectively by the media, and food and medical industries for decades, depriving the world of vital nutrients. You will find it hard to believe your eyes when you see the very disturbing truth presented at http://www.ravnskov.nu. Though not new to whole-foods nutritional scientists, it will seem to most to be amazing findings by these many other nutritional scientists, physicians, academicians, et al. Now enlightened, they present a unified, strong voice exposing the myth and "madness." Below is their initial, clear statement, which if published by me or my colleagues would likely have meant stiff prison sentences. Better late than never! "For decades, enormous human and financial resources have been wasted on the cholesterol campaign, more promising research areas have been neglected, producers and manufacturers of animal food all over the world have suffered economically, and millions of healthy people have been frightened and badgered into eating a tedious and flavorless diet or into taking potentially dangerous drugs for the rest of their lives [i.e., the processed food, pharmaceutical and medical industries have profited]. As the scientific evidence to support this madness is non-existent, we consider it important to stop it as soon as possible. "The International Network of Cholesterol Skeptics (THINCS) is a steadily growing group of scientists, physicians, other academicians and science writers from various countries. Members of this group represent different views about the causation of arteriosclerosis and cardiovascular disease, some of them are in conflict with others, but this is a normal part of Science. What we all oppose is that animal fat and high cholesterol play a role [in these diseases]. The aim with this website is to inform our colleagues and the public that this idea is not supported by scientific evidence; in fact, for many years a huge number of [squelched] scientific studies have directly contradicted it." I am committed to helping as many as I can to overcome past dietary abuses, to continue spreading the effective teaching that it is not Nature's traditional foods that cause disease but stripped, perverted empty calories. Even as misinformation has been and is still being passed from person to person, you too must share what you are learning to prevent further suffering and death. Freely you have received (it has and is costing us a great deal), freely you must give. 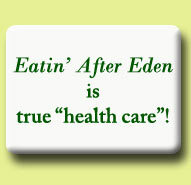 Second, our health is ours and the responsibility for maintaining or recovering it ultimately is ours as individuals. "There is a way that seems right, but the end thereof is destruction... Enter in at the narrow gate, for wide is the gate and broad is the way that leads to destruction and many go therein; narrow is the gate which leads to life, and few there be who find it." There is a natural parallel to the spiritual. We must resolve to be one of the few individuals who take the road less traveled to "take back the night." 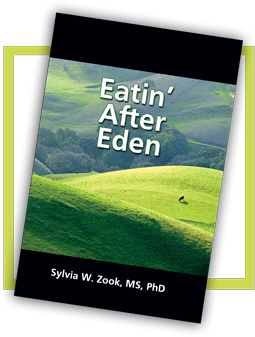 Sylvia Zook, MS, PhD, Real Nutrition & Health," Jan. 2003, Vol. 2. .